By financing your purchase instead of liquidating assets or paying cash, you maintain your financial flexibility. Additionally, your RV may qualify for the same tax benefits as a second home mortgage. The interest on your RV loan may actually be tax deductible. Please check with your tax advisor to see if you qualify for these benefits. Down payments may be lower. Final terms of your loan are determined based on your credit profile and the specifications of the RV you are purchasing. Financing terms are longer AND monthly payments are lower and RV finance specialists know that RV's maintain their resale value and appeal and therefore tend to offer more attractive terms. It is not uncommon to find repayment schedules of 10, 15, and 20 years to help you afford the RV of your dreams. In addition, our finance specialists have all the latest information on extended warranties, tire protection programs and GAP Insurance to help protect your investment. If you are thinking of buying an RV, you should check financing options to maximize your purchasing enjoyment, our RV financing specialists are here to help you do just that. Do I Need An Extended Warranty? When buying a Recreational Vehicle, there's always a chance of mechanical breakdown. However, you'll have peace of mind knowing most problems can be taken care of with an extended warranty from Tom Schaeffer's. Our extended warranties and other protection packages will give you all you need at an affordable price. These comprehensive programs provide different choices in coverage, terms, and deductibles designed for maximum flexibility while providing one of the best benefits packages in the industry. For just pocket change a day, your RV will be protected from the unexpected. When an unforeseen repair is required, the first thing you will reach for will be your service agreement. Whether across the country or across town, our warranties provide all the security you need. Click To Receive A Free Quote or for more information about our protection packages. 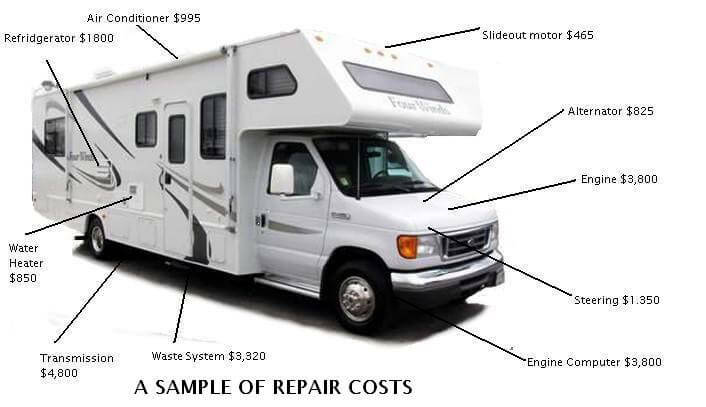 Below is a sample of repair costs that you may experience.